Here’s another pen that I’ve been enjoying with both Spirograph and Wild Gears: PaperMate’s InkJoy. They come in different qualities from the 100 series to the 700 series, with the difference more in the shape and quality of the barrel. The ink is the same, as is the ink delivery mechanism, according to the comparison chart on the Amazon page (scroll down to see). I have the 100RT, 1.0M – the “everyday” quality, meaning cheap, and they do feel rather cheap, but the ink flows smoothly. It makes a finer line than the felt tip pens I’ve been using. My only criticism of them is that occasionally I get a smear when the wheel passes over a clump of ink that hasn’t dried yet. Smearing is more of a problem on high-gloss paper than on regular, more absorbent paper. These pens are very inexpensive, so it’s worth giving them a try. 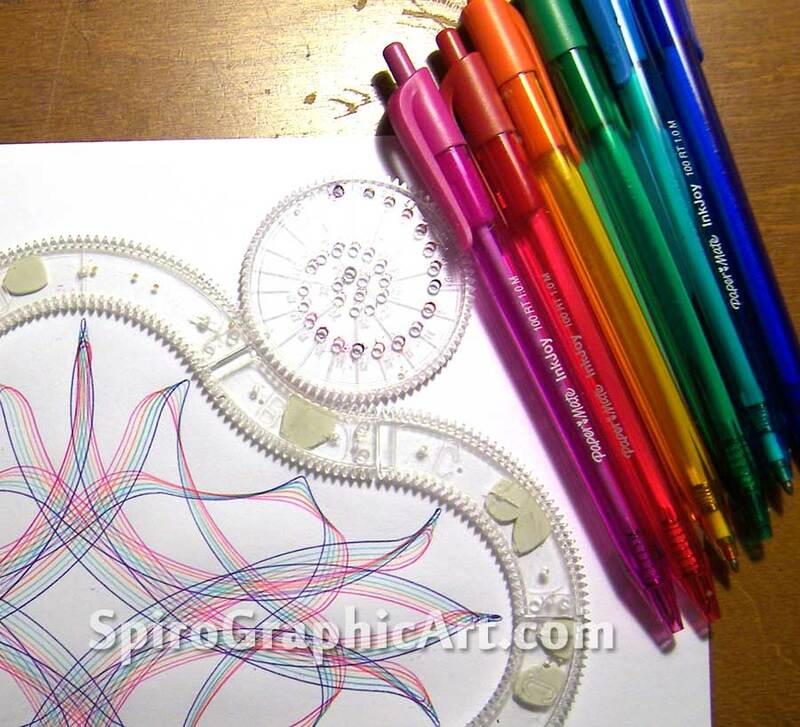 In addition to the Papermate InkJoy pens you speak of in this post, I also tried two other brands of pens with my Spirograph that I happen to have on hand, and which I bought for other purposes, but they get used more with the Spirograph than for those other purposes. Sakura Pigma Micron 01 pens with tips that are .25mm in diameter. The tips are very fine, and the ink is archival quality and does not smear… a few points in their favor. The price is a drawback though. The set of six I purchased http://www.amazon.com/gp/product/B001CRIGZQ cost a little over $10.00 I think the points on these may be fine enough to work with the old Spirograph too… and there is also a set of Microns that has an even smaller tip (.20mm) as opposed to the .25mm that I purchased. http://www.amazon.com/gp/product/B005LU2QAQ The sharpies do smear a little because the ink is a little slower to dry than the microns… but to be fair, the sharpie tips are a little larger than the 01 Micron tips… so a little more ink is laid down with one pass of the pen. The set of 12 Sharpie pens gives you two each of the darker blue and black, and one each of 8 other colors, including a lighter blue. These cost a little more than the Microns I mention above (just over $17 at this writing), but they don’t bleed through the paper like other felt tip pens can do. I also don’t get the big blob of ink with the Sharpies like I do with the felt tips that came with my Kahootz Super Spirograph. The Sharpies are also available in a 24 pack… but there’s little advantage to buying them that way… you don’t get any more or differnt colors than what’s in the 12 pack… just two of each where there was one in the smaller package… and (as of this writing) if you want twice the pens – get two 12 packs, they’re cheaper than the 24 pack. I’ve gotten decent results with both the Sakura Microns and the Sharpies… but I still like ball point pens the best. Thanks for the recommendation. They look similar to the InkJoy and they come in lots of colours – which for me is the main thing, actually! I too have the Ink Joys; I like that they are smooth & don’t require a lot of pressure. However, they are better for more intricate, complex designs. For bolder designs (especially outside-the-ring patters, I use Flair pens. I would only recommend the Flairs on higher rag content papers and/or cardstock weight papers with vellum finishes. They rarely smear, but even on my heavy duty drawing paper (which is ivory colored cardstock), they do tend to “blob” occasionally. They can also smear on anything but the heavy duty. I also bought some Stabilos, but wasn’t very satisfied with them as they’re a little *too* fine; I would describe them as a bit dry. I don’t care for the ink flow. (Maybe I need a more medium point.) I prefer the Staedtlers, although like the Stabilos, they can cause gear slips and ink-skipping too. Just nowhere near as often. I also have an 8-color set of Uniball Signo 207s which are fun to use and are great for when I’m just experimenting. In addition to plain old copy paper (on which I like to test designs with the Ink Joys) I also have Bristol paper and tracing paper. Sometimes when I’m drawing a multi-wheel design, I draw the inner designs on the smooth side of the tracing paper, then cut it out of the paper, apply gluestick to the back, and affix it to the design on the cardstock (making sure it is centered before gluing down). The tracing paper is almost invisible, and if you use bold colors, has a slight muting effect which is very nice. If I could attach pics to this post, I would, because I did 2 designs this way which came out great. Thanks for all this information. If you would like to write a guest post, with photos, you would be most welcome!